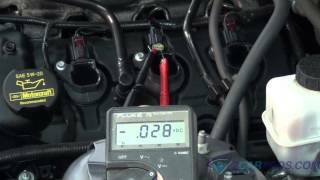 This sounds like a PCM or wiring issue here is a guide and the engine control system wiring diagrams so we can do some testing of the coil wires. If they test okay I would try a used rebuilt PCM. Check out the diagrams (Below). Please let us know what happens. How do you test the camshaft position sensor? The camshaft position sensor provides cylinder identification to the Powertrain Control Module (PCM) (Fig. 3). The sensor generates pulses as groups of notches on the camshaft sprocket pass underneath it. The PCM keeps track of crankshaft rotation and identifies each cylinder by the pulses generated by the notches on the camshaft sprocket. Four crankshaft pulses follow each group of camshaft pulses. When the PCM receives 2 cam pulses followed by the long flat spot on the camshaft sprocket, it knows that the crankshaft timing marks for cylinder 1 are next (on driveplate). When the PCM receives one camshaft pulse after the long flat spot on the sprocket, cylinder number 2 crankshaft timing marks are next. After 3 camshaft pulses, the PCM knows cylinder 4 crankshaft timing marks follow. One camshaft pulse after the 3 pulses indicates cylinder 5. The 2 camshaft pulses after cylinder 5 signals cylinder 6 The PCM can synchronize on cylinders 1 or 4. When metal aligns with the sensor, voltage goes low (less than 0.3 volts). When a notch aligns with the sensor, voltage switches high (5.0 volts). As a group of notches pass under the sensor, the voltage switches from low (metal) to high (notch) then back to low. The number of notches determine the amount of pulses. If available, an oscilloscope can display the square wave patterns of each timing event. Top Dead Center (TDC) does not occur when notches on the camshaft sprocket pass below the sensor. TDC occurs after the camshaft pulse (or pulses) and after the 4 crankshaft pulses associated with the particular cylinder. The arrows and cylinder call outs on represent which cylinder the flat spot and notches identify, they do not indicate TDC position. I had this problem it was corrosion on the plug to the coil pack so look for that. I have no spark from the coil, what could it be? Did you check primary voltage to coil? Yes, it has voltage to the coil but none coming out of the coil. Primary voltage is the brown wire with white tracer, at the coil. Voltage comes from asd relay. Computer won't ground asd relay unless it sees the cam and crank signals. There could other issues. Can you check for applicable treouble codes? To check codes, yourself, at the least you need an obd2 code reader. The national brand autostores should have code readers. Or spring for a scanner that will not only read codes but will also show live engine data. They do call some code readers, scanners, but they won't show live engine data. What is engine litre size? Do you have primary voltage at terminal 2, Note diagram, with engine cranking. Get a helper to crank it. I looked at 3.3L first, then the 3.8l. The coil wiring appears to be the same. Terminal 2 in the diagram is primary voltage. Terminals 1--4--3 are grounds, controlled by the pcm. One ground for each coil, each coil fires two spark plugs. If you use an led testlite between terminal 2 and any one of the grounds, engine cranking, is there a pulse? I got some errands to run, talk to you later. I just found out they change the engine a month ago and that's when the car wouldn't start. When you said, "yes, I did that", what did you do, and what was the result?